Dunlap didn't register any sacks or tackles Sunday, but did put three hits on Steelers quarterback Ben Roethlisberger. Analysis: Dunlap finishes the season with eight sacks and 47 tackles, but only one sack in the last eight games. Dunlap recorded four tackles, one sack and two pass breakups during Sunday's loss to the Chargers. Analysis: Dunlap had an extremely impressive nine-yard sack on third-and-one that pinned the Chargers on the 11-yard line and prevented Los Angeles from getting any points before halftime. This was his first sack in five games after he opened the season by logging seven over his first eight contests. Dunlap (hip) won't carry an injury designation into Sunday's game against the Broncos, Katherine Terrell of ESPN.com reports. Analysis: Dunlap began the week as a non-participant and was limited Thursday, but he isn't listed on Friday's injury report. The 29-year-old should see his usual starting reps at defensive end Sunday. Dunlap (hip) didn't participate in practice Wednesday, Jay Morrison of The Athletic reports. 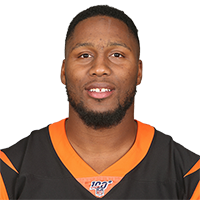 Analysis: Dunlap has been able to stay relatively healthy this season, playing in all of the Bengals' 11 games and logging at least 50 defensive snaps in all but two of them. Whether Dunlap practices later this week -- and to what capacity -- will help clear things up for his gameday status. Dunlap recorded five tackles (four solo), including two sacks, in Sunday's win over Tampa Bay. Analysis: Dunlap's two sacks Sunday give him seven on the year, putting him on pace to best his career high (13.5) from 2015. He'll look to continue his quality play against the Saints in Week 10 after Cincinnati's Week 9 bye. Dunlap recorded two tackles (one solo), including a sack, in Sunday's loss to Kansas City. Analysis: Dunlap's sack gives him five on the season. He's played well despite Cincinnati's struggles as a team. Looking ahead, he and the Bengals will take on the Buccaneers in Week 8. Dunlap recorded three tackles (two solo), including a sack, and forced a fumble in Sunday's win over Miami. Analysis: Dunlap has sacks in three straight games and four sacks on the year. He's proving to be a force along the Bengals' defensive line and a consistent IDP option. He'll be looking to continue his strong play against the division-rival Steelers in Week 6. Dunlap posted three tackles (all solo), including a sack, in Sunday's win over Atlanta. Analysis: Dunlap now has 3.0 sacks through four weeks, putting him on pace for one of the better seasons of his career. He'll have a chance to continue the strong play again in Week 5 as the Bengals host the Dolphins. Dunlap (calf) was a full participant in Wednesday's practice, Richard Skinner of WKRC reports. Analysis: Dunlap was unable to practice on Monday and limited on Tuesday due to his calf injury, but appears trending in the right direction to suit up against the Ravens on Thursday. 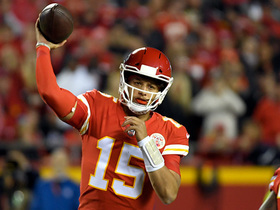 The 29-year-old had a strong showing in the season opener, despite logging one penalty for a late hit and another penalty for roughing the passer. Dunlap will look to serve up another strong pass-rushing performance against Joe Flacco on Thursday Night Football. 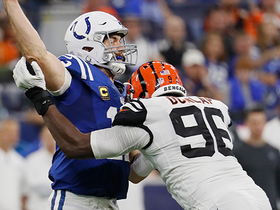 Dunlap was the center of a controversy Sunday against the Colts for his hit against Andrew Luck that was ruled roughing the passer due to his, "full body weight on top of Luck," as Lance McAlister of WLW 700 reports. Analysis: This was the second of two weak penalties called against Dunlap (the other where he hit Luck on the foot as part of a pass rush, that was ruled a late hit). The first penalty allowed for the Colts to kick a field goal right before halftime, the latter he essentially wiped out by recording another sack that took the Colts deep enough that they missed the ensuing field goal attempt. Dunlap is signing a three-year, $45 million extension with the Bengals, Adam Schefter of ESPN reports. 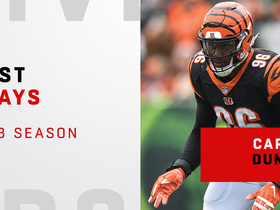 Analysis: With Dunlap and defensive tackle Geno Atkins getting extensions, the Bengals will have at least two high-level performers on their line for years to come. The 29-year-old edge rusher has 361 tackles and 64.5 sacks in 118 career regular-season games, with at least 7.5 sacks in each of the past five seasons. Dunlap is a couple notches below the league's elite in terms of pass-rushing ability, but he makes up for it with solid work against the run and an unusually large number of batted passes. Dunlap had a sack in the Bengals' Week 17 win over Baltimore, giving him 7.5 sacks on the season. Analysis: Dunlap's sack total is a little disappointing, though looking over the last five years, his 13.5 sacks in 2015 look like the outlier. Dunlap also had an interception that he returned for a touchdown this season. Dunlap (chest) won't carry an injury designation into Sunday's game against the Vikings. Analysis: Dunlap suffered the injury in last Sunday's loss to the Bears but was able to finish the week with a full practice Friday. 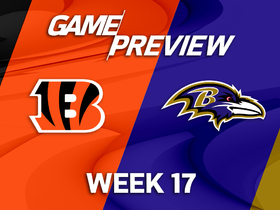 The Bengals' front seven will have a tall task against the Vikings in Week 15 with linebackers Vontaze Burfict (concussion) and Nick Vigil (ankle) both ruled out. Dunlap left Sunday's game against the Bears with a chest injury and is questionable to return. Analysis: Dunlap has 3.5 sacks in his last three matchups prior to Sunday, and he's consistently logging near full snap counts. For the time being, Chris Smith and Jordan Willis will slot in at defensive end. Dunlap increased his sack total to 5.5 in Monday night's loss to the Steelers. 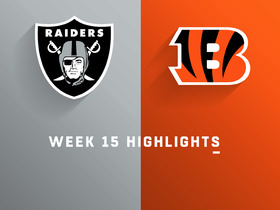 Analysis: Dunlap started the season off slowly, but now has 3.5 sacks over the Bengals last three games. Cincinnati has a matchup against Mitchell Trubisky and the run-heavy Bears offense in Week 14. Dunlap had five tackles (three solo) and a half-sack in Sunday's win over the Browns. Analysis: Dunlap played 53 of 70 defensive snaps in the victory, the most of any Bengals defensive lineman. The 28-year-old has nine tackles (seven solo) and 2.5 sacks over the last two game, and has a matchup with division rival Pittburgh at home next week. Dunlap had four tackles (all solo) and two sacks in Sunday's win over the Broncos. Analysis: Sunday's performance doubled Dunlap's sack total for the season. The 28-year-old played 60 of 81 defensive snaps and will hope to replicate the those results against the Browns next week. Cincinnati Bengals defensive end Sam Hubbard flies past protection to force a fumble. 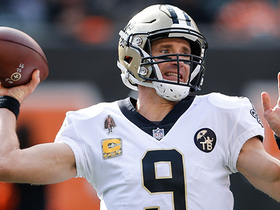 New Orleans Saints quarterback Drew Brees throws a dart to wide receiver Michael Thomas for the touchdown and Thomas celebrates by honoring wide receiver Dez Bryant. 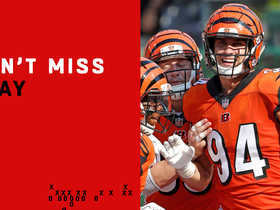 Cincannati Bengals defensive end Sam Hubbard snags an interception off QB Ryan Tannehill and returns it to the house for pick six. 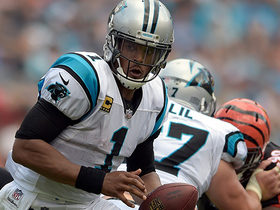 Carolina Panthers quarterback Cam Newton recovers his own fumble against the Cincinnati Bengals in Week 3. 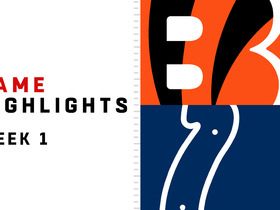 Watch the highlights from the matchup between the Cincinnati Bengals and Indianapolis Colts in Week 1 of the 2018 season.